– In collaboration with the 3rd year BA students of DOCH. The full-the searching-the exhausted-the senseless-the void-the young-the overwhelmed; body. Margrét Sara Gudjónsdóttir studied at the dance department of the Art Academies in Arnhem and Amsterdam, and graduated in 2002. Margrét Sara co-founded the performance production company Panic Productions in Iceland in 2004 along side Sveinbjörg Þórhallsdóttir. Since then she has created three performances and two performance installations for gallery spaces, in addition to two collaborative works with invited artists under the name of Panic Productions. She lives and works in Berlin. Margret Sara has worked as a performer and collaborated with amongst others: Gisele Viènne and Dennis Cooper, Erna Ómarsdóttir and Jóhann Jóhannsson, Constanza Macras/Dorky Park, Esther Salamon, Jan Fabre, Jared Gradinger, Anne Tismer and Rahel Salvoldelli/Gutes Tun. Choreography: Margrét Sara Gudjónsdóttir. Dancers: Marie Ursin Erichsen, Rodrigo Bravo Lima Vilarinho, Louise Dahl and Annie Kay Dahlström. Light designer: Jens Sethzman. Music and movement are enough. – That is the statement that “Ta” makes. “Ta” is the musical seed from which this whole spectacle grows. At the same time this syllable has many meanings in many languages. In Swedish it means “grab”, In Romanian and French “your,” in England it can be a way to say goodbye. We found so many meanings attached to a single syllable once we started to look. “Ta” is an adaptation from a choreographic work by David Hernandez, originally set on his own DH+ group, called Hullabaloo. He was invited by DOCH to create something for the third year dancers and decided to remake a version of Hullabaloo for these dancers. The result is “Ta” , a spectacle in which movement and music come together to ride that line between concrete and abstract. Situations and scenarios are created where the zone between design and meaning are explored. In this zone meaning can be gleaned from a gesture or relationship, a sound or syllable, a look or a wave of the hand. David Hernandez was born in Miami, he studied studio music, jazz and opera at the University of Miami and dance at the New World School of the Arts. He worked as an apprentice for a time with the Trisha Brown Company. He moved to Europe with Meg Stuart to help her start Damaged Goods in Belgium, working as a performer, collaborator, training the company and often assistant to Stuart. He left the company to return to building his own body of work in Brussels under the nameEdwardvzw. He has created several pieces including the solos ‘Love letters’, the quartet “the essence of its going”(98) and the sextet ‘Blueprint’ (2002). He frequently collaborates as choreographer, dancer, composer, pedagogue and dramaturge with Brice Leroux (France), Labor Gras (Berlin), Rebecca Murgi (Italy), Anouk Van Dijk (Amsterdam) and Rosas (Brussels). He developed, in collaboration with Meg Stuart & Christine De Smet, the improvisation projectCrashLanding(1996-1999) which crashed down in such locations as Leuven, Vienna, Paris, Lisbon and Moscow in major festivals and houses, and did improvisations for several other festivals, with many wonderful artists such as Katie Duck, Steve Paxton, Vera Mantero among others. He created several multi-media projects and happenings such as ‘Filter’, ‘Innersections’ and ‘Performance Hotel’ in visual arts spaces and theatres. He developed and directed The Performance Education Program (PEP) in Leuven in residence at the Klapstuk festival. He teaches regularly in Belgium and internationally and has been a core professor at PARTS, teaching technique, composition and improvisation, rhythm and dance and repertory projects. Choreography: David Hernandez. 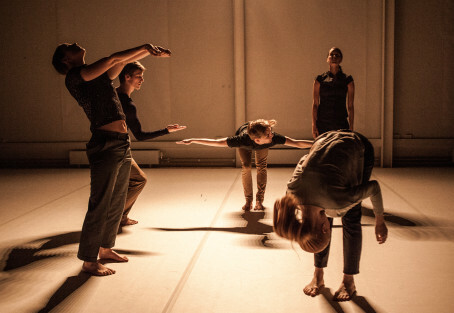 Dancers: Johan Bandholtz, Tove Brunberg, Nathalie Eriksson, Elias Girod and Lovisa Rosell.Light designer: Jens Sethzman. Music: Michel Debrulle.